20 May 2013, 16:04 p.m. This year, many broadband service providers in developed markets will have to make a strategic choice -- just cut costs and plan to report more pay-TV subscriber losses, or seek ways to offer greater value-added services and make the required investment in infrastructure. Infonetics Research released excerpts from its latest market study which delves into service provider strategies for deploying residential gateways, the applications driving their deployments, and their top picks for residential gateway vendors, services, technologies, and associated features. "Operators continue to morph their fixed broadband network strategies to focus not only on the size of the connection to the subscriber, but also on the services and revenue these broadband connections can deliver," said Jeff Heynen, directing analyst for broadband access and pay-TV at Infonetics Research. 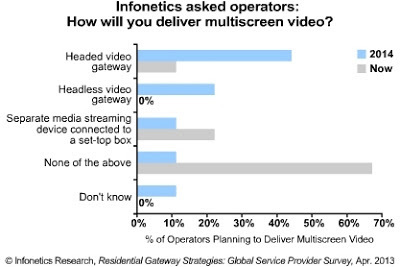 According to the Infonetics assessment, residential gateways are critical to ensuring the successful delivery of these services within the home -- particularly new video services. Their most recent survey shows that the percentage of service providers offering multi-screen video -- wireless delivery of video to mobile phones, PCs, and tablets -- using a residential gateway device is growing quickly, from just 6 percent today to 50 percent by 2014. The savvy video entertainment service providers are looking to differentiate basic pay-TV services and keep customers from moving to competitors or, increasingly, deciding to terminate services entirely. Broadband data, IPTV, WiFi hotspot access, and VoIP are the main applications operator respondents are currently offering using a residential gateway. The number of operators offering home automation services using a residential gateway grows to 44 percent by 2014. Well over half of respondents are using copper Ethernet to deliver broadband services. Huawei and ZTE are perceived as the top residential gateway vendors by over a third of survey respondents.